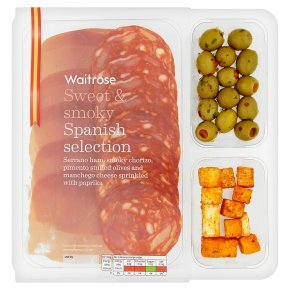 A selection of Spanish dry cured ham, Spanish cured sausage seasoned with paprika, pimento paste stuffed Spanish manzanilla olives with chilli and Spanish manchego cheese with paprika. Pork leg, salt, sugar, preservatives sodium nitrite and potassium nitrate, antioxidant sodium ascorbate. Prepared with 155g of pork per 100g of finished product. Moisture is lost during curing and maturation.